Hi, I’m a chronic screen capturing fiend. It’s true! If there’s an application review to do, I snap a pic. If I happen to stumble upon a funny image, I snap a pic. If I find a glitch or error, I snap a pic. If I see someone saying something not so nice on some social network, perhaps about our beloved smartphones, you bet your sweet bippy I snap a pic. There’s no question that you’ll always have a need for a screen capture. The question is which screen capture application should you go with? When I switched over to a BlackBerry 7 smartphone, my long time capturing app was unable to make the journey with me; it wasn’t supported. I was then on a quest for something new. I remember looking at ZonaSnap a few months ago and decided to give it a shot. Though I had it for less than a year, it quickly became one of my most-used apps of 2011. Read on to see why. What I like about ZonaSnap, is that I can use it to capture a screen in virtually any application. If I can’t see it in the menu, I can always assign it to my convenience key. Not all screen capturing apps can say that. Now what made me choose it over other apps is the selection of settings it comes with. After snapping a screenshot, ZonaSnap immediately gives me some very useful options. Above the image sample I can choose to send to a BBM contact/group, upload to Twitter, send in an email, send to Photobucket, save the image or access your options/settings. You make be thinking what should have been added to this list is the Editing option. It can be found in the menu or by highlighting, and clicking on, the actual image. If you want to edit, you can use functions such as cut/crop, draw lines/rectangles, blur or highlight. Now if you go into the settings menu, you can try additional tweaks like choosing a file type (jpg or png), deciding on the image quality or adding the watermark. 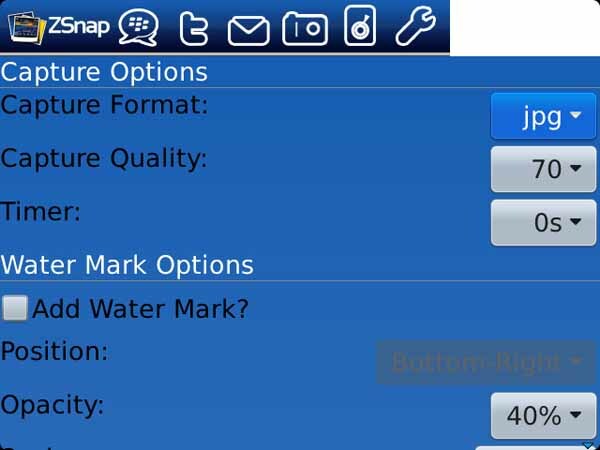 Speaking of the watermark, Zonasnap can let you set its positioning, opacity, scale and rotation. The cool thing is that you either use the default ZonaSnap watermark or choose to use any image of your own! I choose not to use the watermark and you can to, if you register the application that is. 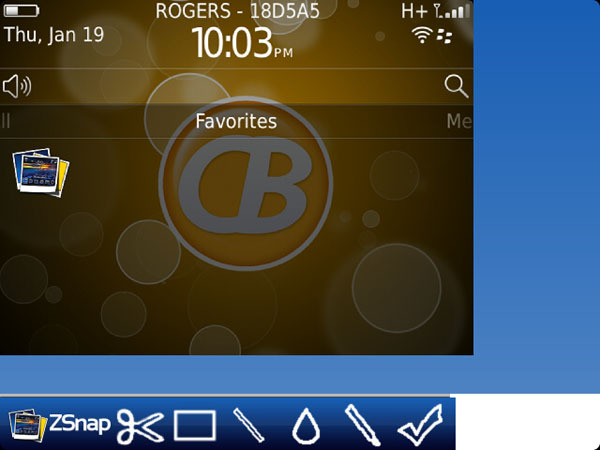 ZonaSnap is a solid screen capturing application, with a decent set of options to make use of. The quick links to share or post make it so easy to share, whatever you happen to capture, quickly and efficiently. As I said before, it quickly became one of my most used apps, and it might be yours as well. The only criticism I can think of is that I could see some more image editing options that could be added, such as the ability to add text. 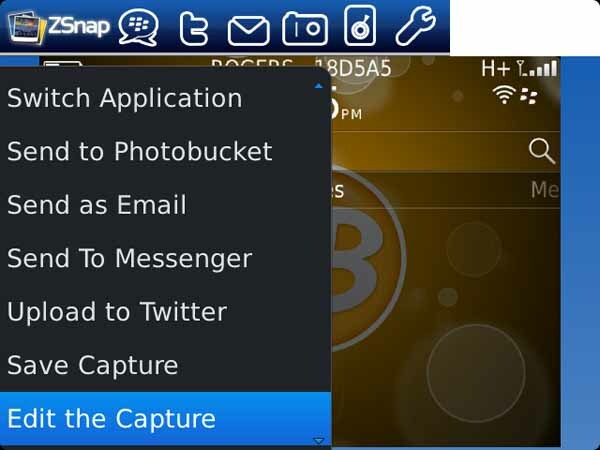 You can grab ZonaSnap for $1.99 form BlackBerry App World-remember that you do have a 7 day free trial period to use, as well.